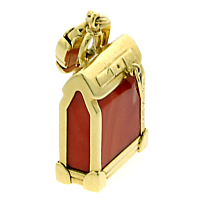 A wonderful authentic Louis Vuitton Steamer Charm in coral and yellow gold. The romance of steamer travel is remembered in this fine Louis Vuitton charm that depicts a steamer trunk. What a marvelous gift this would make for someone about to undertake a long trip!